The Transportation Safety Board of Canada (TSB) concluded that marginal weather and the pilot’s cannabis use were factors in a fatal accident in Canada in October 2011. 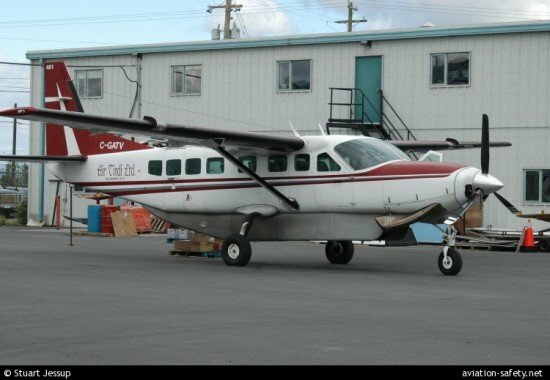 The Cessna 208B Grand Caravan was operating under visual flight rules (VFR) as Air Tindi Flight 200 from Yellowknife Airport, NT (YZF) to Lutsel K’e Airport, NT (YSG), Canada. The flight departed during daylight hours with one pilot and three passengers aboard. When it did not arrive on time, a search was launched, and the aircraft was found 26 nautical miles west of Lutsel K’e on high terrain near the crest of Pehtei Peninsula. The pilot and one passenger were fatally injured, and the two other passengers were seriously injured. Although no emergency locator transmitter (ELT) signal had been received, it was found to be operational when the search team found the aircraft. The TSB investigation revealed that the aircraft was flown at low altitude into an area of low forward visibility, which prevented the pilot from seeing and avoiding terrain. Weather during the accident flight was marginal for VFR flight, and the aircraft did not have a terrain awareness and warning system (TAWS) or terrain-warning features on its GPS. The pilot, aircraft and company were all qualified to operate under instrument flight rules (IFR). Flying under IFR would have provided a margin of safety given the weather conditions. It could not be determined why the pilot chose to fly under VFR. Toxicology testing revealed that concentrations of cannabinoids found in the pilot’s bloodstream were sufficient to have impaired pilot performance and decision-making during the flight. According to the TSB, Air Tindi has taken measures to improve safety, such as dispatching all scheduled flights under IFR; installing cockpit imaging and flight data monitoring devices in its Cessna 208B fleet; and introducing random drug and alcohol tests for employees in safety-sensitive positions. The ELT manufacturer made changes to its ELT designs to improve signal detection, and it also revised the instructions on how to secure ELT installations properly in aircraft. Transport Canada enacted regulations requiring TAWS to be installed in all turbine-powered aircraft with 6 or more passenger seats by July 2014.